Previous: Crace, Sir John G.
The Craters were completed in 1942-45. 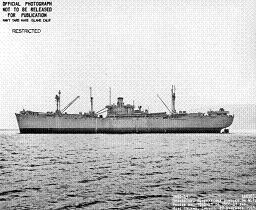 They were Liberty Ships (Maritime Commission EC2-S-E1 hulls) armed and manned by Navy crews for cargo delivery close to the combat zone. completed 1943-11-10 (Richmond) Employed as a transport until 1944-8-20.